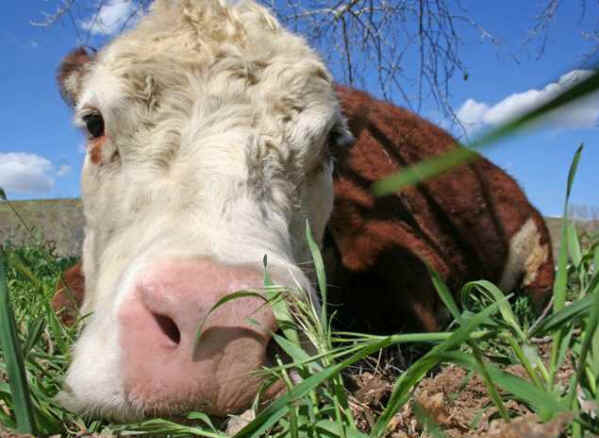 Buddha was part of a miniature cow breeding program in Washington. Life was pretty great until they found out she could not get pregnant and earn her keep. They were going to send her to slaughter when we just happened to call them at the right time. We had her shipped to California to live at The Gentle Barn, to be appreciated for her kind soul instead of the alternative. Buddha is our therapy cow here at the barn. When we have disabled kids (or any kid or adult for that matter) come to visit, they gather around Buddha in their wheel chairs and hug her and pet her while Buddha holds completely still until they are done. She is wise, gentle, and like her name, truly an enlightened being. One day we rescued a big brown pig with floppy ears who smelled like molasses and had escaped from a slaughterhouse in Downey, CA. The pig, who we named "Susie Q," was depressed and laid in the yard not wanting to eat or play. At nightfall all the other animals went to the warm barn to sleep for the night, all except for Susie Q. When Buddha saw that the pig was all alone, instead of sleeping in her soft, straw bed, Buddha lay down next to Susie Q for 6 days until the pig felt better. Together they both got up and Buddha showed her new friend where the food, water and bed were and they remained best friends from that point on. They always ate, played and slept together until Susie Q passed away of old age two years ago. Over the last ten years, Buddha has taught thousands of children/people about the importance of empathy. We are doing everything in our power to ensure she will be here for years to come. Buddha receives injections to rebuild cartilage in her knees, deep tissue massage therapy to ease her sore muscles, and special food to boost her immune system. Buddha has given her life to the care of others. She is a true ambassador of what The Gentle Barn stands for. Please join us in celebrating her birthday and her life's work.